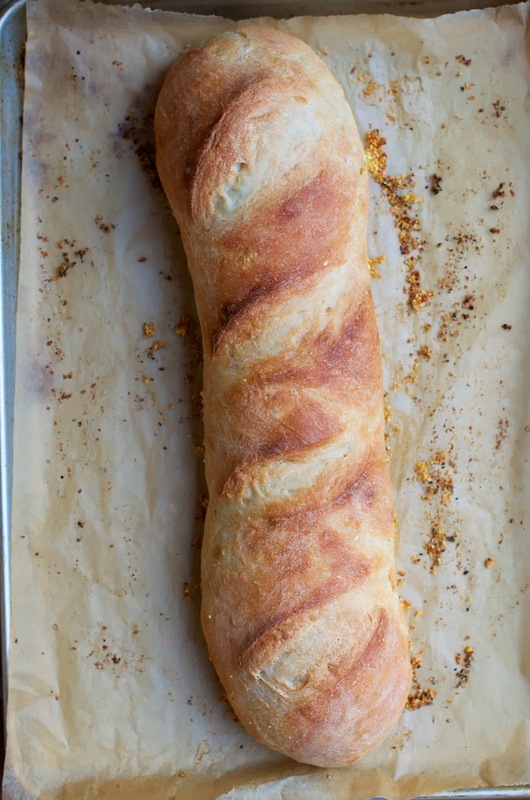 French bread as a holiday classic?! Yep, always. I am a big fan of late-mornings holiday-weekend Shakshuka (poached eggs in tomato sauce) brunches. Without fail, we always have it with French bread or baguette, otherwise it's just not the same. On Holidays and New Year's Eve cocktail parties, toasted bruschetta or crostini with various toppings, I always make with day old French bread or a baguette. Besides, since this French loaf is best the day of, if by any chance you've got leftovers, you can make bruschetta or crostini as appetizers before dinner the following evening. Toasted French bread rubbed with fresh garlic, drizzled with olive oil and topped with diced tomatoes and basil or lemon Meyer Moroccan preserves layered on toasted bread with slices of avocado, some capers and if you wish, add some sardines to the mix, it's absolutely heavenly. Some other classic holiday breads you might wish to bake this season are: the Tea Ring with five different fillings, cranberry date, cinnamon pecan, poppy seed, date orange and maple nut and the Finnish Pulla, with an aromatic cardamon scent that fills the house with a ring of the holidays. Speaking of holiday brunch and mornings, trust me, your family would love to wake up to whiffs of these cinnamon buns. This post is a part of my continued professional collaboration with Red Star Yeast. See the entire series in the links below. 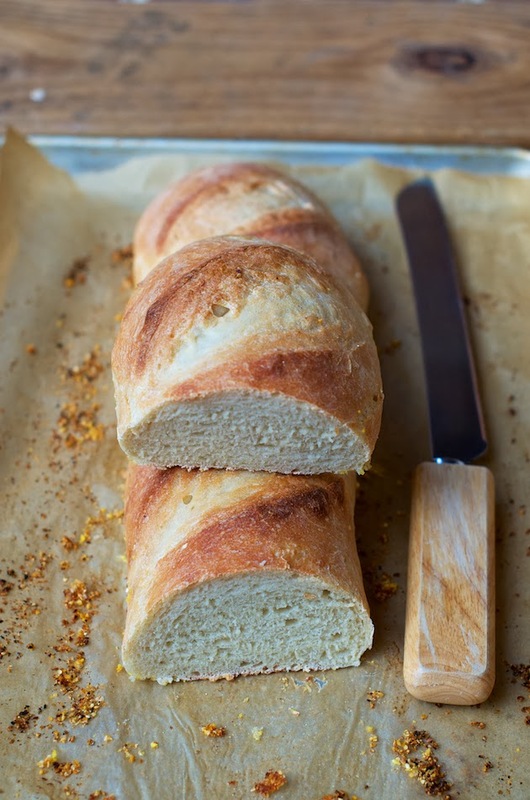 An excerpt tips from Red Star Yeast site: "An American version of the classic French Bread. Spray or brush with cold water during baking for crispy crust. The bread is best eaten the day it is made." In large mixing bowl, combine 2 cups flour and other dry ingredients. Heat water to 120º to 130ºF. Combine dry mixture and water on low speed; beat 2 to 3 minutes on medium speed. By hand, stir in enough remaining flour to make a firm dough. Knead on floured surface until smooth and elastic, 5 to 7 minutes. Place dough in lightly oiled bowl and turn to grease top. Cover; let rise until dough tests ripe. Turn dough onto a lightly floured surface; punch down to remove air bubbles. Roll or pat into a 14 x 7-inch rectangle. Starting with shorter side, roll up tightly, pressing dough into roll. Pinch edges and taper ends to seal. Place on lightly greased cookie sheet sprinkled with cornmeal. Cover; let rise until indentation remains after touching. With very sharp knife, make 2 or 3 diagonal slashes across top of loaf. Brush with cold water. Bake in preheated 425ºF over 30 to 40 minutes. Spray or brush loaf with cold water several times during first 10 minutes of baking for a crisper crust. Remove from cookie sheet; cool. Author's Note: The original RSY recipe called for 3 1/4 cups bread flour but I found that I needed more than 3 1/2 cups flour and the dough still came out beautifully soft and supple. Such a gorgeous loaf, this wouldn't last long in my kitchen! Thanks Laura. It's was incredible how it puffed in the oven after 10 min of spritzing with water. Thanks so much Anusha. Jonathan made ohio, jalapeño omelets to go with it of lunch the other day. 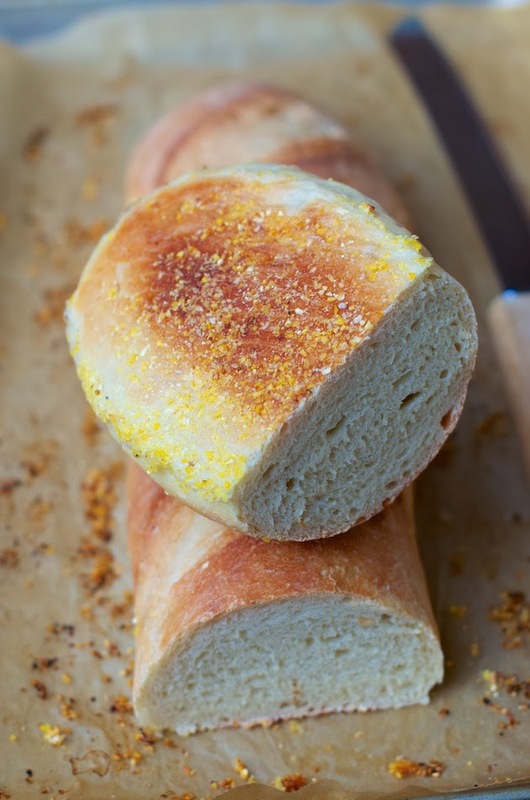 My family very much enjoys homemade bread with soup, salads, pasta, stews and yes during the holidays! An outstanding loaf that would be devoured quickly at my house! What a picture perfect loaf, Shulie! It makes me want to rip off a piece and smear it with butter...totally irresistible!!! Pinning this beauty. I love holiday breads, but a good french loaf is absolutely perfect year round! We eat french bread here like crazy, in every sandwich and toast. The crumb came out amazing Shulie! Have an awesome 2014 my friend!